This is my favorite card. I love the variety it brings to the game. It is a tricky card to play well, and at least as difficult to write a good article about. Some dominating cards like Rebuild or Cultist make all the games look the same so you can give pretty specific rules for those games. For Black Market I can't go much beyond general advice and some examples. Only play Black Market in an engine. Fortunately an engine is almost always viable with Black Market on the board. In general, you should play engines unless a) the engine is too weak or b) something else is too strong. That may sound like lame advice but what I'm trying to say is that Black market on the board simply makes a) impossible. Your Black Market-engine will eventually always be powerful enough. The most important thing to take away from this is: the decision whether to play with Black market does not depend on the content of the Black Market deck. It depends almost entirely on the regular kingdom and whether that allows you to build an engine. The Black Market will always provide you with payload for your engine, and it will always contain some useful cards and some mediocre ones. 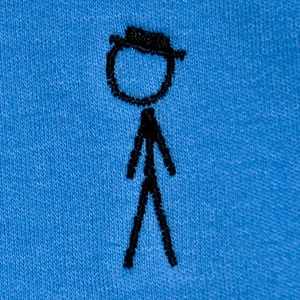 A tricky thing to get right with Black Market is the balance. The card itself is terminal, and so are many of the cards you buy with it. All those shiny prizes can easily lead you astray from your main early goal: somehow get to the point where you can play your entire deck every turn. Get the engine running. This is important in almost any engine, but especially so in engines that allow you to gain mid-turn, and Black Market is the very star in that category. Far too many players focus on gaining certain cards from the Black Market in their analysis of the board or gameplan. Black Market is a terminal payload card that gets you even more payload cards. With those kind of cards it's much better to play your only copy more frequently than it is to get multiple copies. Your initial plan should be to play with 1 Black Market. Exceptions arise when you can't significantly get the frequency up (no trashing, no village+draw) or when the Black Market contains some cheap bombs. I estimate 10% for 0, 60% for 1 and 30% for 2 early copies. 2 copies is more likely in a mirror then when you play against some form of BigMoney or slog. 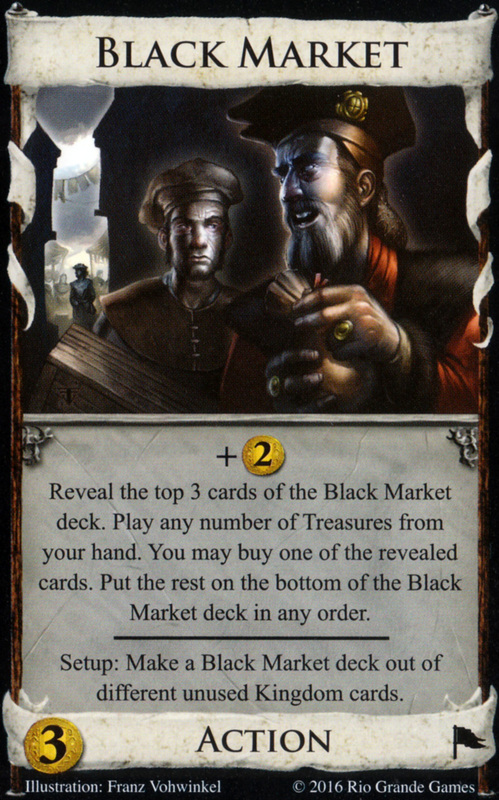 Sometimes the Black Market contains some exceptionally strong cards in the given kingdom. I don't like writing this section because almost everybody overestimates the importance of this already, but hey - it does exist. Tournament is likely to be the one; it could be Ambassador, any trasher, Possession, Goons, Tactician or King's Court. It's really rare that the bomb is a junker like Witch. If you're in a game with a bomb in the Black Market, make sure to have a plan. This plan could be a) I'm just going to get the bomb and win because of it or b) I'm going to build a deck that has a chance even when my opponent gets the bomb. If b) is an option I always go for it, but sometimes it just isn't and you should probably buy a second Black Market. If your opponent doesn't mirror, look for ways to slow the game down. You will always win the long run. How are they going to end the game before you have more? If it involves a 3-pile, can you prevent buying from those piles? Tactician is amazing because you can just use all your money on the turn you play Tactician. You and your opponent both open Ironworks/Black Market. On your turn 3 you have 3 coppers and both your action cards. What do you gain with Ironworks, and do you buy something out of Workers Village, Smithy, Spice Merchant? How does this affect your gameplan? You gain a Walled Village. Your deck will require lots of villages. You buy the Spice Merchant. That's really a great early card to remove coppers and increase cycling. You open Black Market/Workshop and your opponent prefers Black Market/Ironmonger. On your turn 3 you draw all the shelters, a copper and the workshop. What do you gain? On turn 4 you get Black Market with 4 coppers and you get served Council Room, Wharf, Squire. What do you buy? You return them all and buy an Altar. Wharf is a great card but not what you need in this kingdom. Draw is provided by Library and reliability comes from scheme. You open 4/3 but get a coin token from Baker in the Black Market. What do you buy? Fishing Village/Wharf. First mission is to get the draw up and make the engine running; add Ironworks on your next $5 miss and mostly hunt for Wharfs. Maybe you'll pick up a Black Market late, maybe not, but it's not likely to have too much impact on the game. You open Black Market/Quarry against a Journeyman/- opening. On turn 3 you have $4 for a Moneylender and turn 4 is $3 for another Black Market. On turn 5 all of these cards clash and you gain Vagrant+Inn. Turn 6 is nets in a Mining Village and on turn 7 you finally get a good turn. You have $6 to spend when Black Market presents you with Herald, Mountebank and Tactician. In the meanwhile your opponent bought a Gold, 2 Silvers and 2 Journeyman. What to get now? As Black Market Player you can completely ignore the provinces if you have to, and without +buy your opponent can't 3-pile either. even though Mountebank is a great card. You open Black Market/Marauder versus Silver/Marauder. Your opponent continues with Trader, signalling BigMoney. What is your gameplan now? Thanks for the insight as I'm one of those guys who has trouble with this card. This is for me a classic example why you would ignore Black Market. If there is a strong engine already on the board, what exactly are you planning to get out of the Black Market to make it worthwhile? But you say, go for BM if there is an engine viable. Would you open with BM on a 4/3? I'm confident I wouldn't. the decision whether to play with Black market does not depend on the content of the Black Market deck. Let's say there is everything on the board for an engine but the draw. But the BM deck contains no draw cards either. Why should I go for BM then? Even if there's only 1 draw card in the BM deck, getting it is a gamble. You also say that going for BM might depend on a bomb in the BM deck. This does conflict with your statement that going for BM doesn't depend on the content in the BM deck. Let's take the Fishing Village/Wharf example. Would you go for BM if there is a Tournament or Tactician in the BM deck!? I don't think BM is a very good card here, that's why I didn't open with it in the actual game. A 3-pile is going to happen for sure and fast, so there isn't much time. But on 4/3... opening Fishing Village/Black Market looks reasonable. I don't like double fishing Village or Fishing Village/Ironworks, because I really want to hit $5 for wharf on the second shuffle. The advantage of Fishing Village/Conspirator is only marginal and long-term anyway. What you're hoping for is any form of trashing; Ironworks becomes super-strong with trashing here. Mint is probably best but chapel is also good. With so many buys the highway could also enable a 3-pile (estates?). Off course it's possible to create a kingdom and two sets of Black Market decks A and B where I would go for the Black Market with A and not with B. So if you take it literally my statement is false. However, I can't remember the last time my decision actually depended on the content of the Black Market. And when I watch video's of other players playing a Black Market game, that's always the first thing they focus on. Really surprised you didn't gain a second Ironworks. You want lots of villages but you don't absolutely need one right away, and a second IW will get you more of them in the long run, with Great Hall ensuring that it's never in the way. You open Black Market/Workshop and your opponent prefers Black Market/Ironworks. When you state it like that I'd have to agree with your opponent. Man, you had me on this one. I spend like 10 minutes thinking about it but couldn't figure it out, even though I really wanted to because spots like this confuse me a lot. Then I read the spoiler and had to laugh. So the best way to get your car out of a muddy ditch is to not get in it in the first place! But... when you see the alternative is Trader-BM, how can you not take the dive? For me BM is only viable in generally weak kingdoms or if there is an engine on the board which is lacking something, like the payload, the Attack or the trashing. This sounds reasonable on some surface level, and that's probably why it sticks in many people's heads, but it's actually complete nonsense that stems from evaluating cards on their impact alone rather than evaluating their expected pay-off relative to their opportunity cost. Black Market's opportunity cost is just extremely low because regardless of what happens, it's still a terminal Silver. That and people underestimate mid-turn gaining and the huge advantage of having exclusive access to 25 extra cards, the denial of which alone is valuable yet invisible without the proper counterfactual perspective. Well, I guess it is possible. I had a really weird board during my last league season. It would be cool to read your opinion about it. A real engine couldn't come together here with Uni being the only village and Wishing Well being the only draw and not a lot to help out in the BM. Still, with a board as weak as that and some nice cards in the BM we both went for it. Do you think we both misplayed going for BM here? Or did we misplay by not building more towards that engine? (I know I misplayed going for that Knight, but, oh well) Or is it just a rare exception? /E: What I want to say is, even though an engine is hardly possible you want to go for Black Market because of the otherwise very weak board and those few nice cards in the BM. Yeah, I was really confused by this until I realized that ironworks wasn't in the kingdom. Also watch out for the eponymous card in this category, bomb. I think the point is that, practically speaking, the BM deck will almost always have enough good cards to make it worthwhile. Unless you've got something in the kingdom that just makes it irrelevant, like FV/Wharf. I'm glad I got that puzzle right because I was also a little confused by Stef's statement that you should always go for BM in an engine. I was like "man, I would totally just get FV/Wharf here and ignore the BM." Black Market's opportunity cost is just extremely low because regardless of what happens, it's still a terminal Silver. I think the main power of BM comes from the extra options it gives you. When you play BM, you don't have to take one of the three revealed cards, you can still pick one of the regular kingdom cards if you turned over 3 bad cards. It's a supercharged terminal silver with high versatility. I think you misplayed it indeed. Too many terminals, too many collisions. Those nice cards in the Black Market don't justify the investment you make. Games like these is what made people compare Black Market to a clumsy Woodcutter in the first place. It looks like what you did here is weaker then BigMoney-Cutpurse. However, if you go BigMoney-Cutpurse, I could try to actually build the engine. hope to get Golem, Urchin, Familiar, Upgrade, Tournament. Maybe Mountebank, Jack. In a mirror I would expect neither player to really get the engine running. In that case you need to time well when you abandon it. OK, thanks a lot for clearing that up. I guess I wouldn't dare to build an engine with only WW as +card. Too bad we can't influence the content of the BM deck, I'd like to test this again. Huh? A terminal Silver with no bonus is much worse than a real Silver because of the risk of terminal collision (resp. the need for an extra Village). Just look at Duchess, which is among the very weakest $2- cards although you can often get it for free. Or Woodcutter and Chancellor, whose bonuses usually aren't enough to compete with Silver. Black Market is only better than Woodcutter if you're likely to prefer many Black Market cards over the supply cards (ignoring Tactician tricks etc.). Black Market is only better than Woodcutter if you're likely to prefer many Black Market cards over the supply cards (ignoring Tactician tricks etc.). 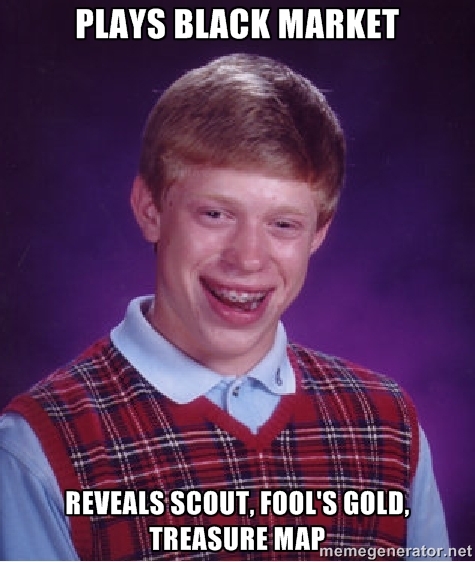 I like how revealing Scout is still worse than revealing Peddler. Peddler can actually be useful, if you have a Quarry and you can use scaling TfB later (e.g. next turn) to make a province (e.g. Butcher & get two free coins, Forge it with nothing, or Salvage it for free). If I've got 2 or 3 Quarries in play (normally setting up for a megaturn with instant 3-pile), Peddler is a cheap cantrip that does something useful. Another really strong synergy is with Haggler. If you have useful 2's and 3's (e.g. Nv, Village, Haven) there is no downside risk and getting your bonus card during your turn is huge (just like with HoP). The downsides are that you can be forced to take a copper (or something else marginally less bad), and that you need one more action to get a Haggler into play. If there are decent massable 2's, you are only forced to take a copper for $2s and very few $2s are good enough you really need to buy them (especially when you can always buy silver instead later) but not so good that taking a copper is worth it for getting the bomb (e.g. Chapel). I've found Haggler to be quite viable on the vast majority of boards with viable Bm. Another good synergy are with cards that care what is in your hand: Menage and Poor house. Getting the coppers out of play makes a lot faster to ramp up even with light or no trashing. Just like with Tac, Bm getting the coin in play and out of hand makes for all manner of fun. No trashing game, but you can draw deck? Load up on +buys and then stock up on Poorhouses - highly efficient action cash. Got lots of Villages? Bm -> Menage can draw huge amounts of cards (particularly if you slow trashing, weak sifting, or shelters to get around estate stops). I don't think Vineyard directly makes Black Market better, it's more that Vineyard makes all engines much better, and Black market is helped indirectly by that. I do agree Vineyard + Bm is really, really good, but the synergy section looks more focused on cards that work specifically better with Black Market. A couple are there because on interactions with playing Treasures in the action phase, I'd say Throne Room is the only odd one out. Oh please. 80% of what you will buy out of the Bm deck is going to be actions. Vineyards thus are assured to be high yield, space efficient points that don't deplete the province pile - in other words a way to slow down the game. Further what stops vineyards from being good in strong engines are: lack of excess gain (excess gain is provided by Bm and the odds of nabbing action gainers out of the Bm is astoundingly high), green intolerance (green tolerance provided very nicely with high odds in the Bm deck from cards like Xroads, Warehouse, Cellar, Oracle, Catacombs, Farming Village, etc. ), action imbalance (again countered by the higher rate of villages and cantrips in play), and early 3-piling (shockingly the other guy 3-piling you out before you can build out your exponential point gain is vastly less common when 8 of your gains are not from the kingdom). For fun, Bm also virtually assures that all components needed for a strong Vineyard push (trashing, villages, draw, sifting, etc.) are present in the game. The biggest problem stopping "Bm" engines are a need to have enough points left to overcome some quick rush or some high point slow slog deck. Vineyards does exactly that - you can let a fast strat choke on provinces while gorging on Vineyards for a the win and you can out build a long haul slog as very few things can compete with huge piles of actions and vineyards. By far this is higher synergy than Tr, and I'd argue more than Hop (while cards mid-turn are big, they don't increase strategic viability as much as turbocharged point gain potential). Certainly, if synergies are just about what matters for playing treasures in the action phase a lot of stuff is missing: Jack (an inferior version of Wt), Mandarin (replay treasures for profit), Diadem (get cash for Action while still using the actions), Loan (knowing how much draw to play after trashing a copper to be sure I don't shuffle ill-timed) and of course all the treasure actions that can trigger other effects (mid game Ventures triggering Tunnels to gain gold to draw & trash, Counterfeit triggering Market square for the same reasons, etc.). Synergy is where the outcome is more than just the sum of parts, and Vineyards/Bm is definitely that; the cards are extremely complementary, handily ensuring that options that could beat either alone cannot beat the combo. One thing with BM is that when there is no potion cost card in the kingdom I never get the potion cost cards in the BM deck, even if they're really good. Vineyards gives you another reason to get a potion, which maybe you can get a familiar or scrying pool from the BM deck with. Just a minor thing. One thing with BM is that when there is no potion cost card in the kingdom I never get the potion cost cards in the BM deck, even if they're really good. so good. so, so good. dominion is an awesome game for this to be possible. Gotta be efficient when most of your hand coordination is spent trying to apply mascara to your beard.